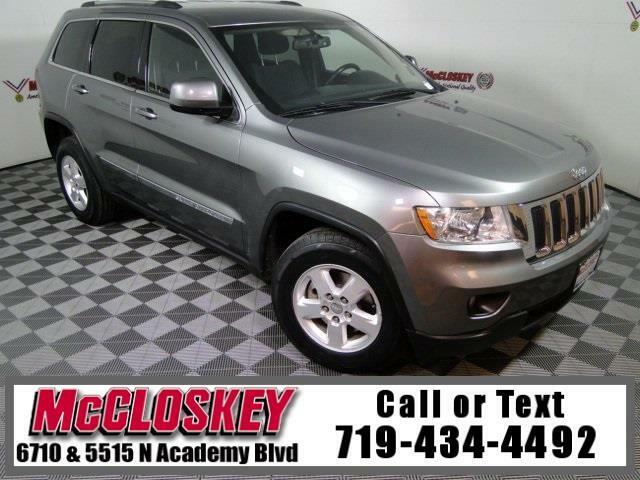 Beautiful and well-appointed 2013 Jeep Grand Cherokee Laredo 4x4 with Keyless Entry, Sirius XM Radio, AUX and USB Connection, and Fog Lamps! Standard equipment for the Laredo includes 17-inch alloy wheels, automatic headlights, foglamps, cruise control, full power accessories, dual-zone air-conditioning, a tilt-and-telescoping leather-wrapped steering wheel and a six-speaker sound system with a CD player and auxiliary audio jack. Jeep Grand Cherokee comes standard with Chrysler's 3.6-liter V6 good for 290 hp and 260 pound-feet of torque. With a cleanly styled dash, tight seams and panel fitment and high-quality materials from door to dash, the Jeep Grand Cherokee's cabin keeps pace with the best in class.